CULVER CITY, Calif.--(BUSINESS WIRE)--NantOmics, LLC, the leader in molecular diagnostics and a member of the NantWorks ecosystem of families, announced today the completion of a Round A finance series for a leading On-Demand Digital Pathology Company, OptraSCAN, Inc. The funding will support the acceleration of product line expansion and manufacturing of OptraSCAN Multispectral, Confocal and Frozen tissue whole slide imaging scanners, and machine vision based image analytics systems to further enable access to Digital Pathology. NantOmics and NantWork's Augmented Intelligence platforms of unsupervised machine learning and machine vision will be integrated into the OptraSCAN pathology devices to establish state of the art intelligent pathology diagnostic tools in this era of immunotherapy in cancer, enabling the 2D and 3D identification of immune effector and suppressor cells. This news is announced in conjunction with the 2016 Pathology Visions annual conference in San Diego, CA where attendees will have access to expert presenters, thought leaders and pioneers in digital pathology. “We’re pleased to support and enable the expansion of OptraSCAN’s digital pathology platforms with our artificial intelligence platforms and this series of funding,” stated Patrick Soon-Shiong, M.D., founder and CEO of NantWorks and leader of the Cancer MoonShot 2020 program. “These integrated solutions will have the potential to maximize quality, quantity and efficiency of pathology clinical capabilities and directly align with the Cancer MoonShot 2020 vision to accelerate next-generation personalized care for oncology patients. Combining OptraSCAN’s portfolio of digital tools with NantOmics and NantWorks platforms has the potential to be a game-changer for clinical scientists across the globe; we’re thrilled to be supporting the company’s ongoing ventures. Our aim is to integrate our whole genomics, transcriptomics and proteomic analysis (GPS Cancer) with this next generation pathology visualization machine enabling diagnosis of the immunome." 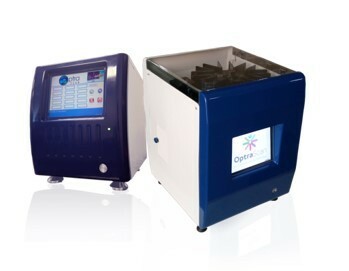 The OptraSCAN Digital Pathology platform and solutions are made easily accessible through OptraSCAN’s On-Demand system that provides instant access to digital pathology infrastructure through an affordable, monthly subscription, and placement of a small footprint WSI scanner at the pathologist’s lab, at no additional costs. These multispectral scanners handle up to 300 slides of scanning, storage and analytics. Easy-to-use solutions for managing, archiving, sharing, storing and analyzing slide images are made available On-Premise or via Cloud-hosting for all stakeholders involved in the utilization of digital pathology images. 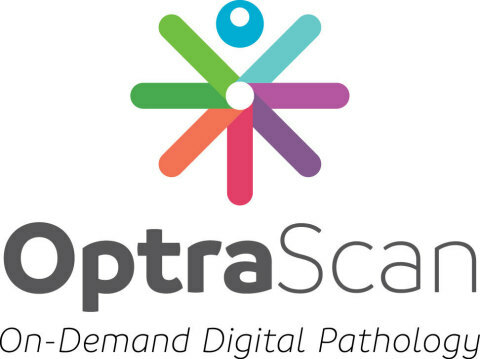 OptraSCAN (www.optrascan.com) for research-use-only, is the first On-Demand Digital Pathology System to provide a comprehensive, affordable end-to-end Digital Pathology solution for both low and high throughput users. OptraSCAN serves as a perfect tool for the transition from conventional microscopy to Digital Pathology for the effective acquisition of Whole Slide images, viewing, sharing, analysis and management of digital slides and associated metadata. The On-Demand solutions include a small-footprint, high and low throughput WSI scanner OptraSCANTM, an integrated image viewer and image management system ImagePathTM and telepathology TELEPathTM, image analysis OptraASSAYSTM and CARDSTM (computer aided region detection system), as well as 10 TB of complimentary cloud storage. Focused on delivering fully integrated Digital Pathology solutions that maximize quality, efficiency and throughput of its customer’s pathology lab (at minimized cost), paired with a complimentary Whole Slide image scanner and viewer—OptraSCAN provides a complete Whole Slide Image solution system via an On-Demand pay-per-use program. Follow OptraSCAN on Linkedin and Twitter. NantOmics, a member of the NantWorks ecosystem of companies, delivers molecular diagnostic capabilities with the intent of providing actionable intelligence and molecularly driven decision support for cancer patients and their providers at the point of care. NantOmics is the first molecular diagnostics company to pioneer an integrated approach to unearthing the genomic and proteomic variances that initiate and drive cancer, by analyzing both normal and tumor cells from the same patient and following identified variances through from DNA to RNA to protein to drug. NantOmics has a highly scalable cloud-based infrastructure capable of storing and processing thousands of genomes a day, computing genomic variances in near real-time, and correlating proteomic pathway analysis with quantitative multi-plexed protein expression analysis from the same micro-dissected tumor sample used for genomic analysis. For more information please visit www.nantomics.com and follow Dr. Soon-Shiong on Twitter @DrPatSoonShiong. About Cancer MoonShot 2020 The Cancer MoonShot 2020 program is one of the most comprehensive cancer collaborative initiative launched to date, seeking to accelerate the potential of combination immunotherapy as the next generation standard of care in cancer patients. This initiative aims to explore a new paradigm in cancer care by initiating randomized Phase II trials in patients at all stages of disease in 20 tumor types in 20,000 patients within the next 36 months. These findings will inform Phase III trials and the aspirational moonshot to develop an effective vaccine-based immunotherapy to combat cancer by 2020. For more information, please visit www.cancermoonshot2020.org and follow @MoonShot2020 on Twitter. GPS Cancer™ is a first-of-its-kind, comprehensive test available through NantHealth. GPS Cancer integrates whole genome (DNA) sequencing, whole transcriptome (RNA) sequencing, and quantitative proteomics, providing oncologists with a comprehensive molecular profile of a patient’s cancer to inform personalized treatment strategies. GPS Cancer testing is conducted in the CLIA-certified, CAP-accredited laboratories of NantOmics, and is a key enabler for the Cancer MoonShot 2020 program, the nation's most comprehensive cancer collaborative initiative seeking to accelerate the potential of combination immunotherapy as the next generation standard of care in cancer patients. A Quantum Imunnotherapy Lifelong Trial in patients with cancer undergoing next generation panomic analysis (genome, proteome, immunome and metabolome) to inform precise cancer care based on individualized and dynamic biology of the disease. The protocols will be designed to harness all the elements of the immune system (dendritic cells, T-cells, and NK cells) to combine vaccines and cell based immunotherapy with metronomic chemotherapy and immunomodulators with the goal of durable, long-lasting remission of the disease with the highest quality of life. This press release contains forward-looking statements within the meaning of the Private Securities Litigation Reform Act of 1995, including, among others, statements regarding the capabilities and anticipated utility of our GPS Cancer, including predicting patient response and resistance to therapeutics, enabling diagnoses by physicians and accelerating efforts to bring novel combinations of therapeutic agents to cancer patients, as well as our contribution to the Cancer 2020 initiative. Forward-looking statements are subject to numerous risks and uncertainties that could cause actual results to differ materially from currently anticipated results. Factors that may cause future results to differ materially from management’s current expectations include, among other things, that GPS Cancer may not perform as anticipated, that sufficient physicians may not adopt GPS Cancer to assist their diagnoses or that healthcare payers may not provide reimbursement for GPS Cancer as expected. Our business is subject to numerous additional risks and uncertainties, including, among others, risks relating to market acceptance of our products; our ability to successfully launch new products and applications; competition; our sales, marketing and distribution capabilities; our planned sales, marketing, and research and development activities; unanticipated increases in costs or expenses; and risks associated with international operations. Information on these and additional risks, uncertainties, and other information affecting our business and operating results can be found in our existing and future filings with the Securities and Exchange Commission. These forward-looking statements speak only as of the date hereof. We disclaim any obligation to update these forward-looking statements except as may be required by law. NantOmics and NantWork's Machine Vision and Supercomputing Platform to be Combined with OptraSCAN Digital Pathology to Provide Next Generation Morphological Visualization of Tumor Microenvironment.